Troubled? Anxious? Tormented by self-doubt? Then come to Unity, the psychic planet! From our therapy centre beside Unity’s idyllic shores, the Unity Corporation can help you to overcome all your problems. How? By using a patented combination of technology and Jungian psychology, we can bring you face to face with your shadow self. The hidden you. The dark you. The you that no-one knows… Rest assured, the process is perfectly safe. Nothing can possibly go wrong – and that’s guaranteed…! This is the last in a loose trilogy of double bills. Maybe it’s just me getting used to the format, but I enjoyed this one best of all. It helps that the writers don’t attempt to cram too many characters or too much incident into their respective two-parters. It feels as though there is just the right amount of story in each one. The modest complement of characters in the opening tale, Shadow Planet, is made all the more distinctive by the casting and the performances. There’s a clear contrast between, for example, Belinda Lang as Mrs Wheeler, the domineering boss of the Unity Corporation, and Sarah Thom as her timid PA Sandy. Being able to tell the voices apart is important in audio drama, and particularly so in this one, because some of the actors double up later on to play their characters’ ‘shadow’ selves. In common with Vortex Ice / Cortex Fire, this release returns us to an earlier point in the life of a companion created by Big Finish who has subsequently moved on within the audio series. Last time it was a pre-wedlock Philippa ‘Flip’ Jackson. This time it’s a pre-death / resurrection / departure (it’s complicated) Thomas Hector ‘Hex’ Schofield (Philip Olivier). The writers take us back to an unspecified point fairly early on in Hex’s travels with the Doctor (Sylvester McCoy) and Ace (Sophie Aldred). He’s still somewhat wet behind the ears and, in World Apart, is struggling to pluck up the courage to tell Ace about his feelings for her. 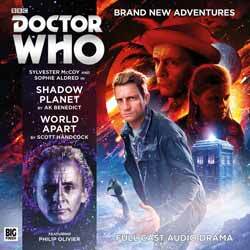 This release might make for slightly awkward listening if you were to try and experience it in chronological sequence (say, between Night Thoughts and The Veiled Leopard), because, paradoxically, back then Sophie Aldred tended to play Ace as a more mature personality than she usually does nowadays. (There’s also the issue of how Hex can possibly forgive the Doctor for what he does in this story…) However, the ‘eager teenager’ version of Ace that we encounter in Shadow Planet and the opening episode of World Apart sets up an effective contrast with the more downbeat Dorothy of Part Two. Scott Handcock’s story is one of those rare occasions (like The Daleks and The Ark in Space) when the TARDIS crew land in a deserted environment and encounter not a living soul during the entire first episode. The difference with World Apart is that the desolation continues into Part Two. In fact, the companions get even more lonely. To say any more about the plot would ruin it for you, but it’s no spoiler to say that this is a fine showcase for the characters of Ace and Hex and the acting skills of Aldred and Olivier. These double bills have been a mixed bag, but if they can be as successful as this release, then let’s hope that more of them aren’t a world away.